Have a leftover piece of steak and not sure how to do it justice? I recommend this glorious pairing. Or, might I suggest using this recipe, sans steak as a side dish, or appetizer. If you are a big blue cheese lover you may want to increase the amount a bit. I used this flat bread recipe from Veggie Belly. 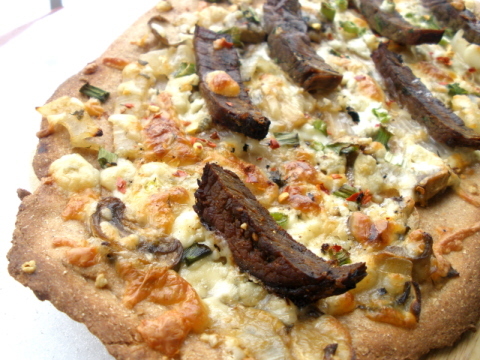 Follow the recipe for the flat bread by clicking here. While the dough is rising, sauté the EVOO, onions, and mushrooms in a large sauce pan over medium heat. Once they onions are translucent stir in the flour, and mix to combine. Then add the wine, garlic, and parsley. Once the liquid has been reduced to half remove from heat and set aside. When the flat bread is done rising roll into two rectangles, and place on cookie sheets. Dividing all ingredients between flat breads spread onion mixture evenly. Now add mozzarella, blue cheese, and green onion. Cook for first 10 minutes without the steak. Then add steak slices to warm up while the crust finishes cooking. Remove when crust is golden brown about 15 minutes.